2 flute, carbide tipped with totally enclosed ball bearing guides. #6515 features a combination angled flush trimmer with a slight beveled edge. Eliminates the need for hand filing. #6519 features non-stick Teflon cased square bearing that stops spinning when it touches the piece, eliminating burning. Do the same work in less time! 2 flute, carbide tipped with totally enclosed ball bearing guide. This bit cuts a slight bevel for a clean cut. No filling is required. 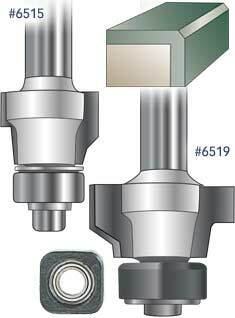 This specially designed router bit includes the Euro™ Square Teflon bearing. 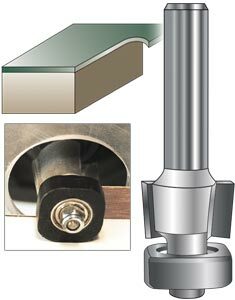 The bearing slides on clean laminate edges and will not scratch your work and glue will not stick! Will not scratch Corian™ and other solid surface man-made materials. Used this bit on two commercial laminate installs. The bearing was working well for a while but it started to wear the corners down fairly quickly then it went smaller then the cutting surface and nearly ruined a piece, caught it just in time. Expect to get 1 -2 jobs out of this bearing, the cutting surfaces are still good but the bearing wears out pretty quickly. 2 flute, carbide tipped with totally enclosed ball bearing guide. 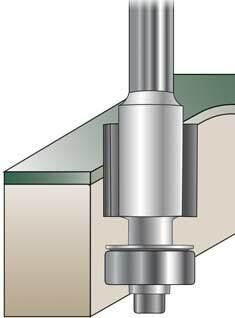 Eliminates glue buildup on ball bearings resulting in a smoother cut and improved production results.